The Add Synced Drawing Layer dialog box lets you add a drawing layer to your project that will automatically be synced with the currently selected layer. Depending on whether the Support Overlay and Underlay Arts option was selected in the Advanced tab of the Preferences panel, the Add Synced Drawing Layer dialog box may look one of two ways. In the Timeline view, right-click on the drawing layer you would like to sync with another layer. From the right-click menu, select Add Synced Drawing Layer. Lets you give the new layer a meaningful name. 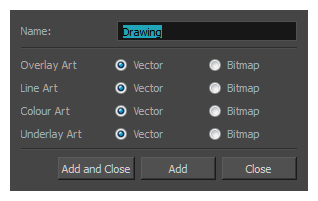 Creates a vector or bitmap drawing layer in the Overlay Art layer. 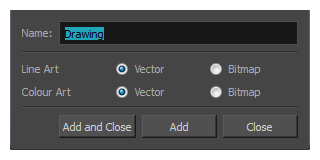 Creates a vector or bitmap drawing layer in the Line Art layer. Creates a vector or bitmap drawing layer in the Colour Art layer. Creates a vector or bitmap drawing layer in the Underlay Art layer. Adds the selected type of layers to the Timeline view and corresponding column in the Xsheet view and closes the dialog box. The names of the layers/columns are automatically numbered incrementally. Adds the selected type of layers to the Timeline view and corresponding column in the Xsheet view. The dialog box remains open for you to add as many layers/columns as needed. The names of the layers/columns are automatically numbered incrementally.